Brand from Japan: Kao. The newly innovated technology helps your skin retain moisture after washing. It effectively helps your skin stay healthy by removing dirt and impurities under continuous use. 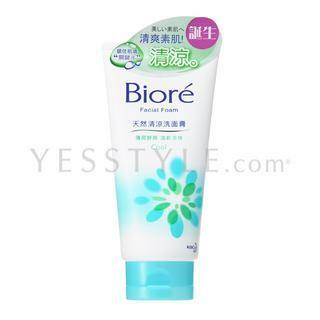 Biore facial foam cool with refreshing natural mint formula can effectively cleanse the greasy feeling away. Leaving your skin clean and refreshing. How to use: Apply in the morning and at night. Wet face, squeeze about 3cm onto palm. Make fine lather with plenty of water, massage gently onto face and rinse off.